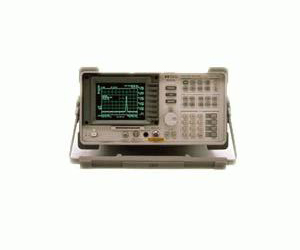 The Agilent 8594L is a low-cost, but full-featured, frequency accurate microwave spectrum analyzer designed to meet your general purpose measurement needs. The easy-to-use interface provides access to more than 200 built-in functions. Frequency counter: Eliminate the need for a separate frequency counter with the built-in frequency counter with ±2.1 kHz accuracy at 1 GHz (±7.6 kHz from 0 to 50 °C). Multiple resolution bandwidth filters: Optimize the tradeoffs of speed, sensitivity and the separation of closely spaced signals with your choice of 10 resolution bandwidth filters beginning at 1 kHz. 142 dB amplitude measurement range: Measures signals directly with -112 dBm to +30 dBm amplitude measurement range. One-button measurement routines: Save time, setup, and training with one button measurement routines such as Adjacent Channel Power, signal bandwidth and Third Order Intercept (TOI). Phase noise of 105 dBc/Hz at 30 kHz offset: Uncover small signals close to carriers with an internal phase noise that will not get in your way. Dual interfaces: Operate remotely and print directly with the optional dual interfaces that combine either an GPIB or RS-232 port with a parallel (Centronics) port.